Where did all the PDF reviews go? [size=30]I get compliments all the time about the reviews we post here. [/size] It’s been my pleasure to be a tech reviewer for this sites and other sites since 2007, and there’s a pretty big body of work with my name on it. When it came time to move this blog to a new platform, I obviously wanted to take all that stuff with me and make it easy to find. I guess I did the first part, but there have been some people who said I didn’t make it so easy to find. Luckily, there’s an answer for that. Click or tap at the top and choose “Reviews.” You’ll see the section showing all the PDF reviews. 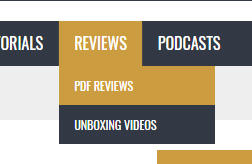 If you tap on “Reviews” again you’ll go to all the articles that review the many things we’ve seen here at the blog. That section is growing, of course, as I move more content over from the old blog. There’s also a link to go to our YouTube channel and look at some unboxing videos. and you can see everything in a new, mobile-optimized format. 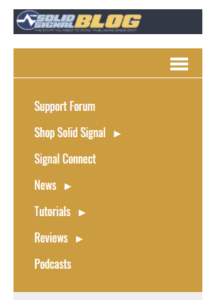 That was a big part of the move to a new platform, because the old platform didn’t do mobile very well.